Admittedly I have not used this in a production sense yet but it looks to be very promising and is all ready supported 60% globally in Firefox 34+, Chrome 31+, Opera 26+, Android Browser and Chrome for Android (source caniuse.com). IE, Safari and iOS Safari and Opera Mini currently do not support the @supports rule. I won’t go and re-write entire lessons and examples of this rule. There is an excellent article over at tutsplus.com by George Martsoukos that speaks a little to using Modernizr, Javascipt detection and pure CSS Feature Queries. In their article there are live coding examples on Codepen, a brief introduction to CSS variables, and a few polyfill fall-backs. For the full W3C Candidate Recommendation paper click here. 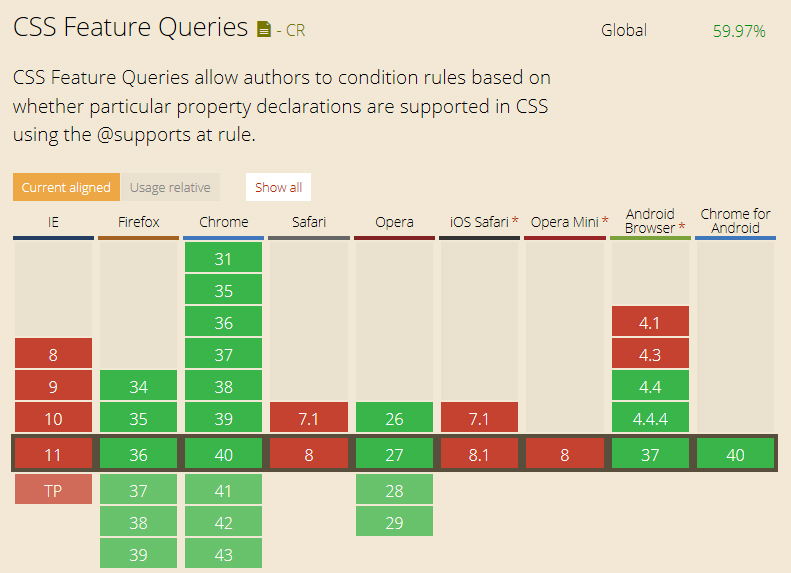 CSS feature detection in pure CSS… it’s coming!